A sprain is a common injury that occurs when the ligaments that hold your bones together stretch or tear under substantial force, motion, or pressure. Most sprains can be diagnosed simply through physical examination. In some cases, however, an X-ray is needed to ensure there is no fracture. Or, if the injury does not improve, magnetic resonance imaging (MRI) may be performed to examine the surrounding soft tissue and ligament. Grade 1 sprain – This is a mild injury in which the fibers of the ligament are stretched but still intact. Grade 2 sprain – This is a moderate injury in which there is a partial tear of a ligament. Grade 3 sprain – This is a severe injury in which there is a complete rupture of the ligament, possibly tearing off a piece of bone. 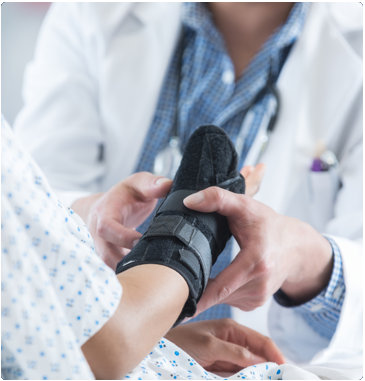 While sprains range widely in severity, most can be treated with nonsurgical methods. For those cases that require more aggressive treatment, we offer the latest minimally invasive procedures performed by expert orthopedic surgeons. Left untreated, a major sprain or several minor sprains can lead to permanent joint instability. So, if you experience a sprain of the shoulder, elbow, wrist, knee, or ankle joints, visit Spectrum Orthopaedics. We will give you a thorough evaluation and prescribe the best course of care for you. To schedule an appointment with an orthopaedic doctor in North Canton, Ohio, call Spectrum Orthopaedics at (330) 305-0838 or use our online appointment request form.